"...testament to a century of Buffalo's history and culture in the Black community." In 1999, historians Dr. Peggy Brooks- Bertram and Dr. Barbara Seals Nevergold created the Uncrowned Queens project to celebrate the accomplishments of African American women community builders in Western New York. 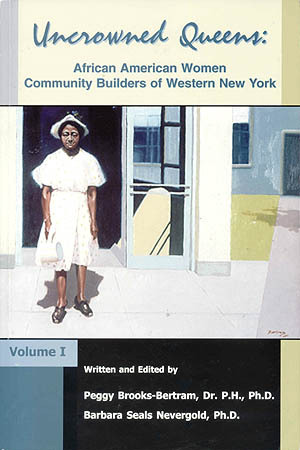 The authors consider this project a continuation of black women's efforts, of more than a century, to uplift their community. This soft-covered book, recognizing and honoring African American women, is the first in a series to document the contributions of these women, some well-known, but many without previous recognition. The book features the biographies and photographs of one hundred extraordinary women from myriad educational, economic, religious, and social backgrounds.